SK Food Group is committed to quality in the production of our products. Our state-of-the-art manufacturing facilities follow approved quality and safety plans from the start of production to finished delivery. Our plants are inspected daily by a United States Department of Agriculture (USDA) inspector, based at our facility. Additionally, as part of our food service program, our facilities are inspected by a variety of federal, state, and local agencies. We also welcome regular 3rd party inspections by our client companies who conduct independent audits. Our Canadian facilities are regulated and regularly inspected by the Canadian Food Inspection Agency (CFIA) to ensure adherence to all interstate product labeling and shipping laws. A Quality Assurance Inspector randomly measures weights in a wrap. Our HACCP certified, in-house Quality Assurance (QA) team manages our quality assurance processes and performs strategic checks throughout each production day. 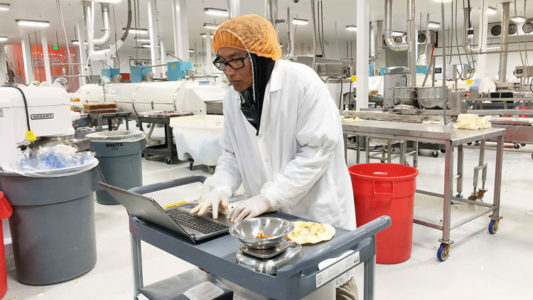 QA inspects incoming ingredients and finished product for quality and specification verification. A full-compliance team, QA literally follows each product from build through delivery, helping to guarantee safe and consistent products. Internal inspections are conducted within the established HACCP plan.